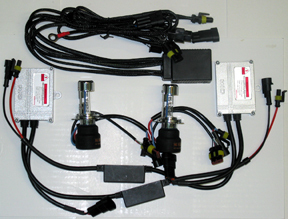 Our True Bi-xenon HID kits are servo motor controled Lo & Hi beam in HID. A servo motor switches, or changes the focal point for the HID electrode to give both beams in HID. All are 6,000K blue lights and about 4 times brighter than stock. All plug n play to install. Relay and battery harness is needed (included in kit)to activate servo motor on electrode and make Hi & Lo beam work.